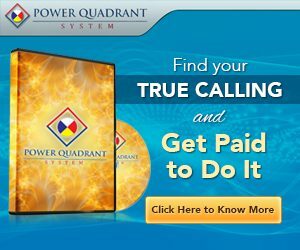 →The Power Quadrant Review – Scam or Real? The Power Quadrant Review – Scam or Real? I would have never written this review of the Power Quadrant System if someone would have told me what it is before I checked their site out or if I didn’t see so many websites with irrelevant content under the google review searches that provides no information on whether this product is genuine or scam. Honestly, when I decided to buy this product for reviewing I thought that it is a personal development product that might be teaching some ways to achieve success by knowing one’s true purpose in life, but then I came to know that it is some ancient calendar crap which promises to decode the destiny that was imbued in our DNA when we were born. I don’t believe that we are destined to be someone before we took birth and I never buy the idea that stars or calendar can say anything about ourselves. But I tried the power quadrant product because it was available at a very low price and since there is a dearth of proper information about this product in the review sites. According to the makers, our key to a successful life is coded in our DNA and by using the right calendar calculation we can determine the right path to make things happen effortlessly. This calendar they talk about is not the one we are using right now, it is an ancient calendar that lost its existence when the Roman’s took over the world and introduced the new calendar. The makers point out a few faults in our calendar, some of which I already knew like this calendar initially had 10 months and October was so named because it was the eight month (octo – 8) in it. They also say that the new calendar misses an entire moon cycle, well I don’t know about that, but how could all this affect our lives? I really don’t know.. but the makers say it does! This product is created by the couple, Ric and Liz, they discovered this calendar, and it helped them during an unfavorable situation where their company was going through a bad phase, which affected their financial situation and inner peace, hence they were losing hope. The calendar told them that Liz was not doing a work which was of her type, so they did what was right and it fixed everything. They came to know about this stuff that they call as the ancient calendar and DNA decoder when it was introduced to them by an old lady who told them stories about a stone that was discovered in the year 1600. This stone has a calendar was carved in it, a calendar that helps people to take the right decisions and it was used by the ancient civilizations to live a happy life that they actually came to live here on earth. Ric says that he and Liz did a ten year long research on this and tested these codes on people, using what they learned and things that worked, they have prepared this power quadrant system. They say that the only purpose of this program was to spread the secret that they have come to know. The makers don’t claim that this discovery is theirs and they say that you will find a lot of information about this calendar in many other places, but what they have done is just a simplification of a process that could take years for anyone to complete. The program is all about the 53-minute audio track that teaches you everything that you actually need to know about yourself using the ancient calendar. In those 53 minutes you will know your codes using which you can make the perfect decisions in your life. This material especially focuses on two main things i.e. career and soul mate. So you will learn to know which is the right profession for you using the codes and you can match these codes to find out who could be your ideal soul mate. This audio talks about a color system using which you will be able to identify under which color your personality fall. Thus it will reveal what type of people will support you and who will cause you trouble depending on the color match. You will be able to know your spouse’s code and learn why the problems in your relationships exist. In this 53 minute audio you will understand why what you are doing is not yielding the results that you want and what you should be doing instead, it will reveal your life purpose and the gifts with which you were born. You will also get a workbook to make the essential notes. You will get a onetime free VIP access to a club where a lot of interviews with the greatest names in the personal development industry are uploaded frequently. You will find the interviews of some very big names like Tony Robbins, John Gray, Neal Donald Walsh etc. and the collection has more than 46 interviews right now. But this is just a one month subscription and you will have to pay for the further access. You will get two books for free if you buy the product right now, the books are “change your mind, change your life” and “action blueprint” that teaches you various stuff about how you can create a better life using various principles. These bonuses may vary from time to time, you will have to check out the product website to know what they are offering presently. Alright, we have reached to the most important part of this review, the conclusion. First of all, after doing my research I came to know that there exists such an ancient calendar which can help people with their important decisions just like astrology, I didn’t believe in it and neither do I believe in astrology. After following this program, a few good things happened, I won’t deny that, but since I do a lot of personal development activities, I can’t give the credit to this program with certainty for what I received. However I suggested it to a friend who is crazy about such things and he said that it works, but I don’t think it worked for me. One thing that kept me thinking was the question why this program is available for such a low price? Because this audio contained things in detail about this calendar that isn’t available elsewhere, so if I was selling it, I would have kept the price high. However, I got my answer soon. See, the real life legends club to which they are giving a initial free access is a real gem because it contains such valuable interviews that it will leave you wanting more, so you will eventually end up paying for the whole subscription. Hence according to me this product is available for such a low price so that they could get you into this club maybe. I hope you enjoyed this post. If you want to achieve some big goals, then I suggest you to try the methods that I use for clearing energy blocks and eliminate limiting subconscious beliefs.